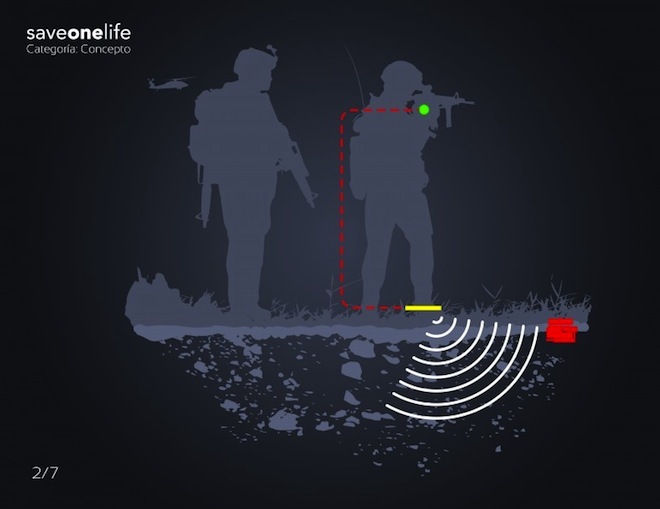 The Bogota-based firm tackled a challenge that many others have attempted before them: how to save people from invisible land mines, which maim and kill soldiers, farmers and innocent civilians in former and current conflict zones all across the globe? Egyptian scientists are working on using bacteria and plants to root out land mines, an Afghan designer modeled his wind-powered bamboo mine sweeper after a childhood toy, but Lemur Studio has taken an entirely different approach. 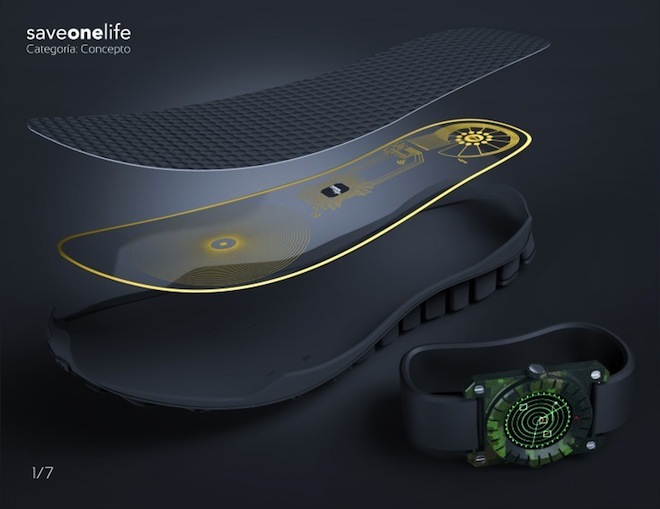 SaveOneLife boot soles are equipped with tiny microprocessors that pick up electromagnetic signals – like a mini metal detector. 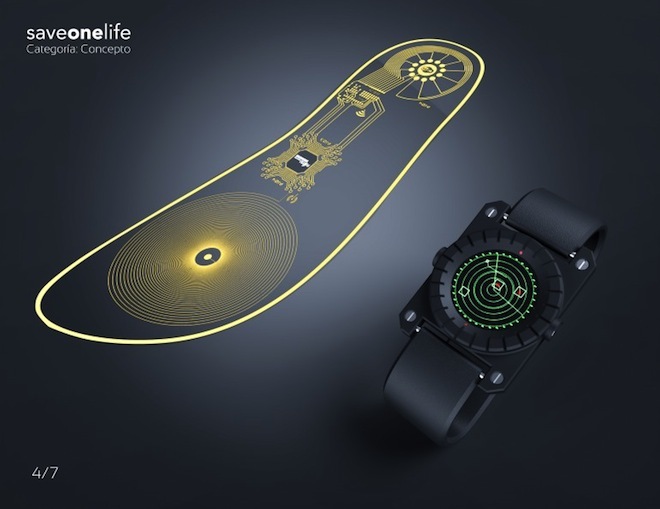 Embedded radio transmitters then send a message to a wristband interface when the wearer steps within a 6.5 foot radius of a land mine, alerting them to the impending danger. And here’s the best part – the wristband interface will pinpoint the land mine’s exact location, mitigating the need for all guess work. 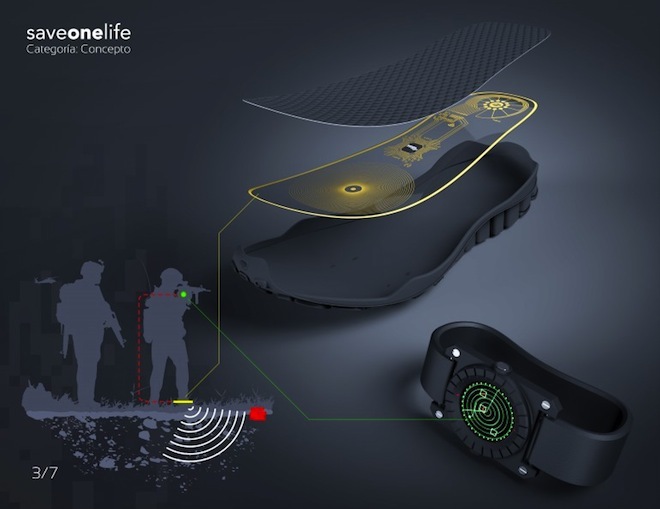 “The device was created with the goal of saving a life, hence the name, first by the families of the victims and second for the cost effects of military forces by the loss of his men in combat,” Ivan Perez, Lemur’s creative director, told Fast Company. They add however that theirs is not the final solution to the land mine problem, which really is quite serious and deserving of greater global attention, but rather a “stopgap technology to reduce the danger from antipersonnel mines,” Gizmag reports. Still in the concept phase, mostly since the group lacks funding, the design has nonetheless picked up a slew of rewards, including the Red Dot Design Singapore award. It is also up for the World Design Impact Prize and winners will be announced later this year. Meanwhile, Lemur Studio has pitched their idea to the military (Colombian, we assume) for funding and support. We fully expect to see this product on the market in the coming years.